If you have damaged the SIM card reading pins on the Logic Board of your Samsung Galaxy Tab 7 Plus, either through accidental damage or incorrectly inserting the SIM card, then our dedicated Samsung repair centre is able to help you! 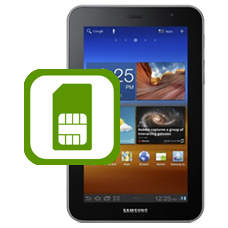 A typical symptom is the Samsung tablet will report a No SIM error, even when one is inserted. This is an in-house Samsung Galaxy repair service, when ordering this service you are required to ship the tablet into our repair centre for works to be undertaken.